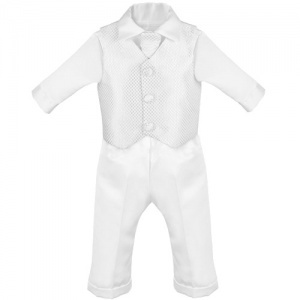 Baby boys white check 4 piece satin suit, perfect outfit for any special occasion including a christening / baptism, wedding or formal occasions. 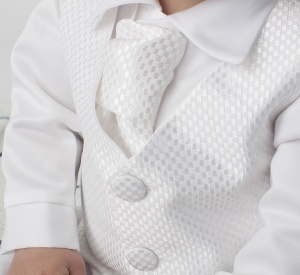 Waistcoat: Satin effect waistcoat with a white check pattern, fully lined, 3 centre buttons, plain back. Tie: Satin effect tie with knot with matching white check pattern. Elasticated for the perfect fit, complimenting the suit perfectly. This white check satin 4 piece outfit will make your little baby boy look like the perfect handsome gentleman at his christening / baptism, as a pageboy or a guest at a wedding. Lovely suit for my son's christening. Plenty of ccompliments by guest. Would definitely recommend! Good quality suit! Fitted well, My son looked amazing on christening day!